Ford is re-creating the same challenge it achieved nearly 50 years ago – unveiling the new Ford Mustang on top of one of the world’s most famous landmarks. 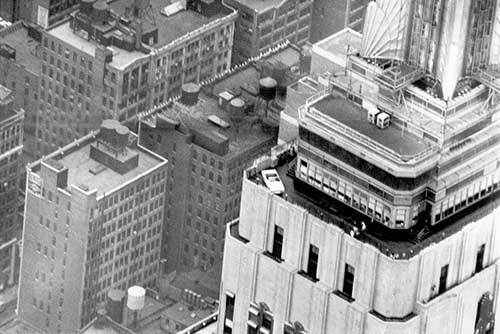 On April 16th and 17th 2014, Ford is celebrating 50 years of continuous Mustang production by bringing the all-new Mustang convertible to the Empire State Building’s 86th floor observatory. This display, replicating the same feat from nearly 50 years ago, coincides with the global celebration marking 50 years since the Mustang first debuted at the 1964 World’s Fair in New York. 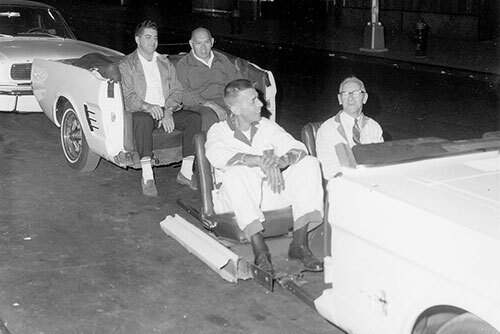 “New York is one of the greatest cities in the world, and it’s the place where the Ford Mustang story began 50 years ago,” said Mark Fields, Ford chief operating officer. Taking a car 86 stories above the densely populated streets of Midtown Manhattan is no simple task. No portable crane can reach the 86th floor observatory, and the spire towering above the relatively narrow deck makes helicopter delivery impossible. That leaves using the Empire State Building lifts as the only option. 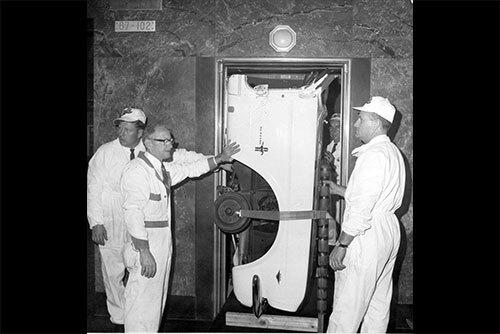 When the Empire State Building opened in 1931 as the world’s then-tallest building (a title it held for nearly 40 years) no one planned on trying to transport a car up in the lifts. 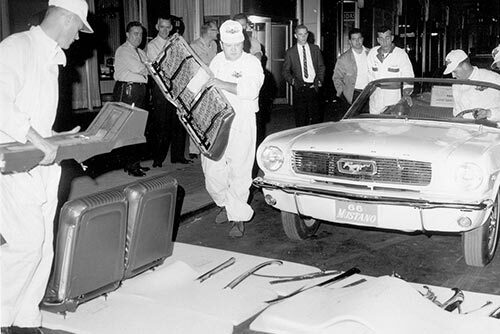 But in 1965, a prototype Mustang convertible was sliced into three sections plus windscreen t0 fit the sections into those lifts. The new Mustang is nearly 180mm longer and 100mm wider than its ancestor, making the task of transporting it up even more challenging. 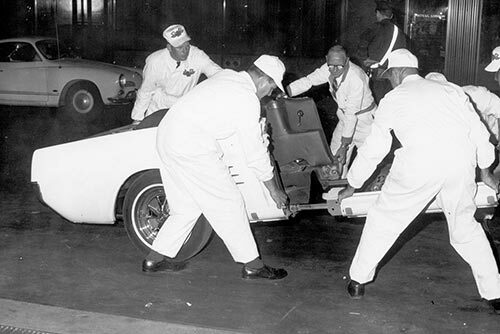 Once everything is transported up 86 floors, Ford technicians will have less than six hours to reassemble the sections into a complete car. 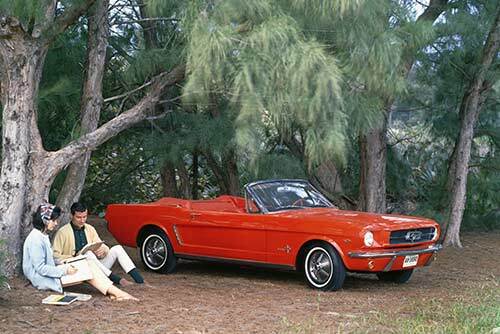 The Ford Mustang was firsts revealed to the world with a television advertising campaign on the evening of April 16, 1964, before being shown to the public at the New York World’s Fair on April 17. The car officially went on sale that day. Ford dealers accumulated a record 22,000 sales and orders that first day on the way to more than 418,000 sales in the first year and 1 million sales in less than two years. Over the past five decades, more than 9 million Mustangs have been sold. Ford promise that the new Mustang is the most advanced Mustang yet. Offered as fastback and convertible and with a range of engines, including an all-new turbocharged 2.3-litre EcoBoost and a 5.0-litre V8 with more than 420 bhp. 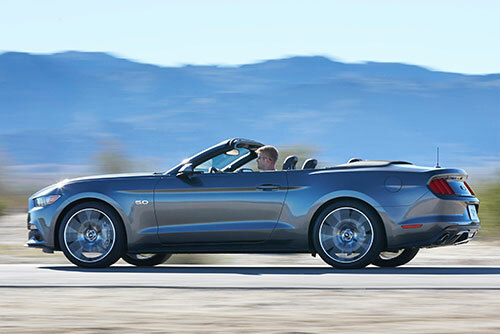 The new Ford Mustang goes on sale in Europe in 2015. Visitors to the Empire State Building observation deck can see the new Mustang convertible from 8am to 2pm on April 16th to 17th.